After using traditional Western veterinary medicine to treat her animal patients for many years, Dr. Judy Morgan discovered a better way to help them live longer, healthier lives. In From Needles to Natural, she shares her journey from traditional to holistic veterinary medicine and helps pet owners understand the differences between good advertising and good health for their animal friends. With more than thirty years of experience as a practicing veterinarian, Morgan blends her personal story as a lifelong animal lover with this collection of professional opinions about animals and animal care. 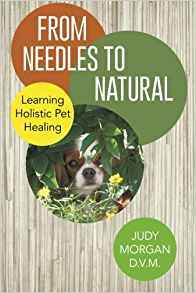 From Needles to Natural covers a variety of topics including pet nutrition and food therapy, pet food labels, veterinary chiropractic care, acupuncture, and understanding the array of vaccines and medications. Morgan, who has produced a full webinar series on YouTube, discusses alternative and supplemental treatments for pet illnesses. While narrating heartwarming tales of the pets she’s treated, Morgan dispels the myths about effective pet care and teaches pet owners the benefits of feeding and treating an animal holistically.